OK, I need to admit that I don't know jack about skiing a slalom course. 1st Can you approach the gate at any angle? 2nd How far from the bouy am I supposed to be turning? (I have heard that you are supposed to be already turned when you go past the bouy, no me. 3. How fast and how much line to start with. Today we spent some time at Lake Billy. I was able to try the course that the ski club maintains. At 32mph I was getting the 1st through 4th practice bouys and the last 2 tournament bouys. Everything felt violent and out of whack. Don't get me wrong it was fun, but I need a little coaching. Ok, now we're going to get into some fun stuff. I had kinda hijacked one of the other threads asking about the West Coast style and mentioning skiing by coordinates, which is the "style" Dr. Jim uses and if he does well in the Malibu Open will probably pick up more followers. 1. Be more efficient at maintaining a tight line in the next turn. This is not practical as we are doing everything we can already. 2. Ski to an earlier “Coordinate” so we have more time to allow the ski to reach its “turning speed”. Our course speed increases as our cross course angle increases which increase our chances of loosing our ideal body position or “base position” which further increase our chances of making more mistakes. 3. Turn downcourse. Doing this increases angle, speed and mistakes and lead to #2 above. Joe, to start go 15' off and drop your speed down to 30 (or even less if you need to) to get the feel. Then as you make runs all the way through, start speeding the boat back up 1 mph at a time. When you can consistently make the course at X speed, bump it up 1 mph again. Dr. Jim Michaels could possibly set a new 36 mph mens record this year. He's a little more advanced than we are. Well, that's Schnitz for ya. I definitely agree that Schnitz's stuff is pretty technical. But the original question was along the lines of "where should I be turning" and I think that description at least talks about where to "aim" for when skiing from ball to ball. Sorry, missed a couple of questions. Setting up for the entry gate I like to pull out even with ball 2 down course. The angle thing...? If you're like most people you will go where you look so don't get fixated on the bouys. You'll end up skiing right to them and then you'll be late all the way down the course. I like to visualize a point 3' upstream and 3' outside of the bouy and apex my turn there. That way that ball hits me on the hip as I'm headed for the next bouy. The only thing low enough to get hit by the bouy would be my shins I'm sure. To get this straight though, to get a complete run you just need to go through to entry gate, around the six bouys and through the exit gate. (any angle, any painful way that I can come up with)? It's called runnin' it ugly!! Oh, you have no idea. Let's just say the video camera is off limits when I am trying to ski. Anyone got a portable course we can take to Oroville? 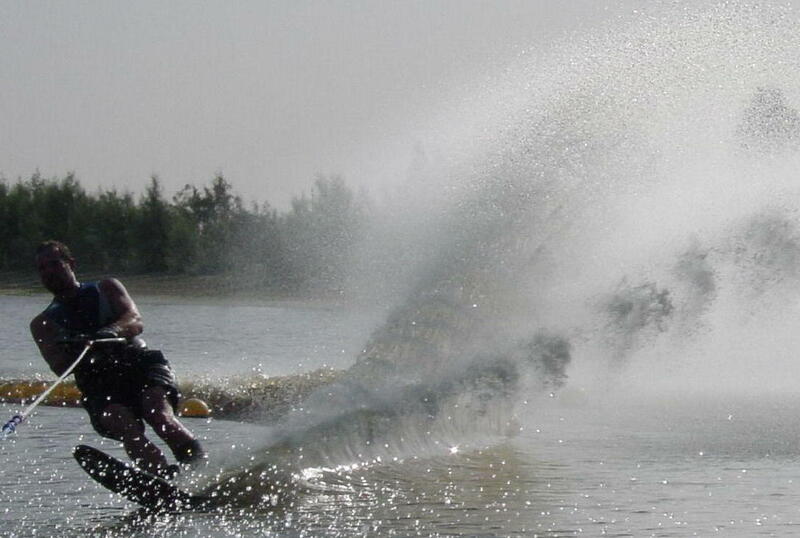 Hey now, I am planning on a full, free coaching lesson on skiing, wakeboarding, foiling, and barefooting. Why else would I hang around here. Glad to see you are trying the course. 32MPH and 15' off is a great accomplishment if you have never been in the course before. 30mph and 15' off is a great place to start. Free skiing and getting 6 balls at any speed are two, completely different levels of skiing. I can't agree more with the statement made above about not looking at the balls. When you finish your turn, give it a rip across the wake and then you will be ready for an edge change and start looking for the ball. There are great sites on the internet with video of people in the course. I just sent you an email of Natalie Hamrick running 32 off like it was a piece of cake. As for when to start your cut to the first gate, do what Michael says and line up with the #2 ball. As the bow of the boat enters the gates, start your cut through the entrance gates. You could even just start at 1 ball and focus on the gates later. Don't look at the boat as you cross the wakes. You'll be addicted once you get the hang of it. You know what? Don't even worry about hitting the gates ( it'll just throw off good body position trying to hit em at this point). Ski 15 off 30 mph (if it's not too slow for your ski) and just work on good body position and cut through just before the gates and work on running 6 from there. Work on your body position and timing. When you pull out, pull out to the count of three, coast for a count of 3 and turn in easy for the gates. When you pull out go 5 feet or so outside the 2,4,6 buoy line. Start your pull out at the 55 meter balls. If you don't have 55 meter balls then stand in the whitewater, look at the left hand gate ball, when it lines up with 5 ball start your pullout. You may have to adjust it to lining up with 3 ball or whatever but don't pull out really hard. It's an easy pullout, easy glide and then easy turn. 15 off you don't need to kill it, just make a nice progressive pull into the 1st wake and hold that pull till you exit the 2nd wakes whitewater. 15 off is an longer even pull as opposed to a 32 off pull which is a quicker pull but more intense. More later, just work on that for now. Please send your tuition fee to me in the form of a bu crew T size Large. Thank you. I have got to start watching some video or something, my "body position" is what ever contorted shape it happens to be at as I struggle across the wake. I just learned a week ago or so that the reason I tear up my rear leg so much is because I am not tucking it in behind my front leg properly. I need about a week and a half with someone who has some kind of clue what they are doing so that I can watch and learn. Assuming that your binding placement is OK> It may be that you are just trying to force the turn with your back leg and then riding the back leg through the wakes. You should be balanced, roughly same amount of weight on each foot, that goes for turning or thru the wakes. Your hips should be up and handle low on your hips or thighs. Take a handle and put the 5 foot section on the trailer ball of your truck, now lean away, knees slightly bent, hips up so they are centered between your feet, shoulders level, head up don't dip it to the side. Weight should be even between your feet. Let me know how that works. You know I used to think that I was a good skiier until someone pointed out those annoying (yet somehow attractive) little red floating balls. yeah! I get buoyitis and sometimes I'm completely debilitated because of it. Seriously though, skip trying to nail the gates, just work on skiing 6, you can always cut the gates after you run 6 and it will be more fun in the process. Can anyone name this slalom machine? Joe I've been waiting for the perfect time to unleash this. Lots of good advice be given here. When I first started the course I took a lesson from Jason Paredes(pro) the first thing he said was forget about the entry gates. He started me out at 28mph per hour until I made all six, It totally felt like I was sinking, but eventually got the concept down. With your size drop down to 30 as other's where suggesting or maybe even 29 if you can stay afloat. The other was concentrating past the ball and not on it. Truer words could not be spoken. I finally got a chance to watch that skiing clip you emailed me. If I can get to where I feel 1/4 as smooth as she looks I'll have had a great summer. Got to Agree (says Addictedto6)....And man am I going through withdrawal! I agree with Rod's comments re: backfoot. I grew up free skiing behind an IO and had the same problem -- weight on the backfoot, trying to turn using backfoot. Lot's of bad habits to unlearn! you might want to check out Gordon Rathburn's 12 slalom drills video for ideas/drills as you work your way into the course. i agree with Rod. skip the gates until you are comfortable getting 6 buoys, then add them. slow down too.